This is an event that I'm really excited about. Live Jazz & art - it's going to be an evening of sophistication. The artwork is by local artist Lisa Finch. It's terrific stuff. Celebrate Hump Day by swinging by Vinalia from 8pm to 11pm for some live music and some great artwork. I was crushed when a client decided last minute (yesterday) that they wanted to have an out of town meeting tomorrow. Because if I was in Boston tomorrow night (ie: All you readers out there) you'd find me at Vinalia. 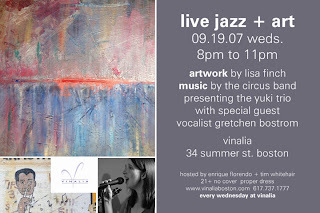 0 Response to "Live Jazz & Art - 9/19"